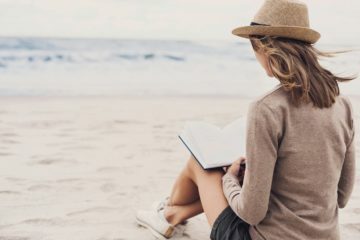 Buying gifts can be exciting but with so many things to choose from, how can you find something that your friend or loved one is sure to enjoy? Fortunately, outdoor photographers are a fairly easy bunch to please. 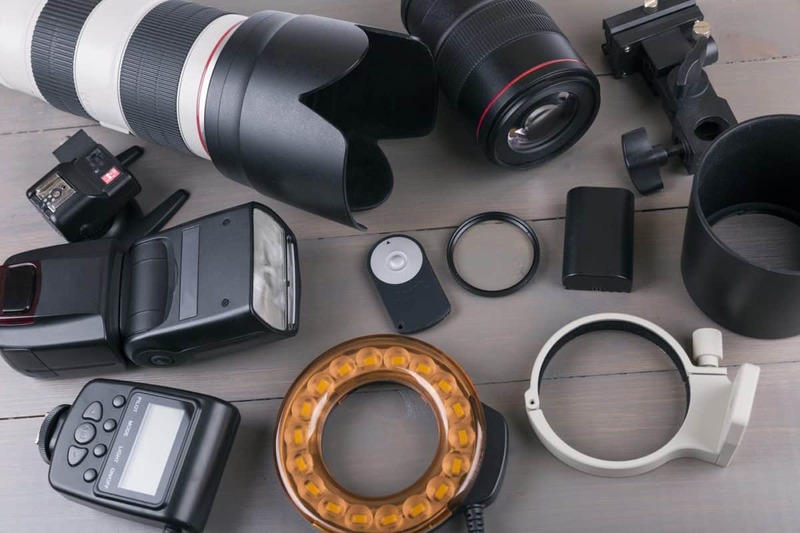 From camera accessories to help them capture amazing images, to gadgets and gizmos to make the outdoor photography experience easier and more fun; there are plenty of things that your outdoor photographer will love. To help simplify the process, and make it easier for you to find that perfect gift –we’ve compiled a selection of 100 best gifts for photographers. With this in mind, let’s explore some of our top picks for photography gifts. This guide includes gifts under $50, gifts under $100, and gifts over $100, as well as things for him, and her –and even budding young photographers. Wondering what to get the photographer who has everything? Wonder no more! 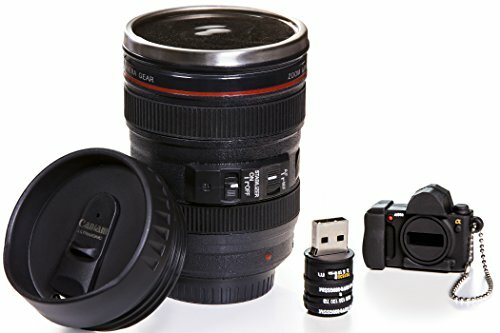 This handy lens novelty coffee mug is perfect for holding a hot drink –and cookies! Speaking of coffee; photographers are on-the-go, getting up early to catch those sunrises. 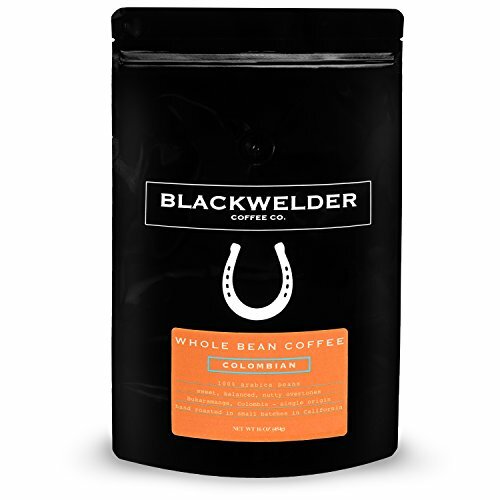 Get them some strong coffee beans to get them up and keep them going. 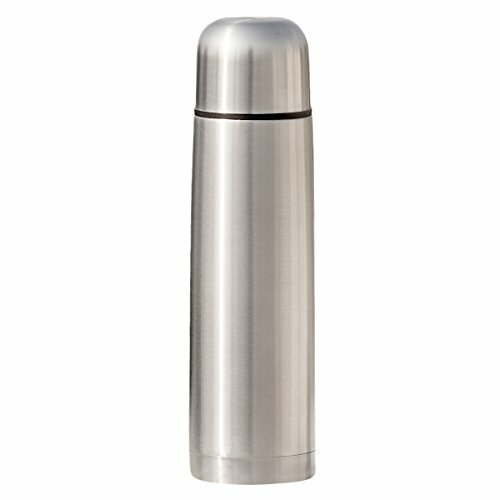 This thermos is perfect for hot coffee or cold tea. 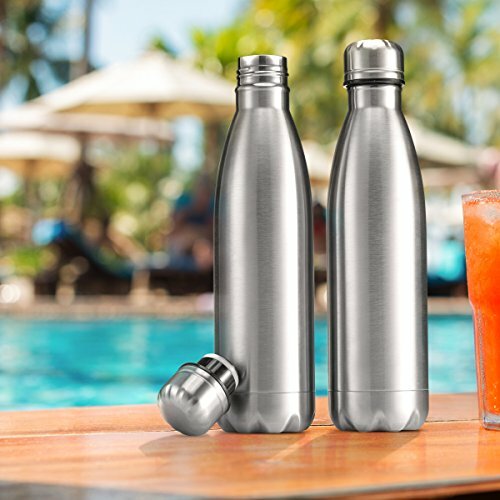 Featuring an easy to clean screw top, its slim line design makes it perfect for travel. 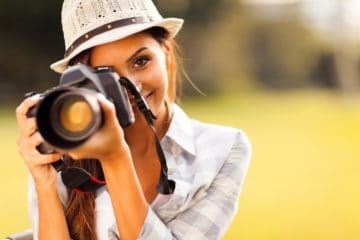 Any photographer who spends time in the great outdoors is sure to appreciate it. A photographer can never have too many SD cards, especially if they’re shooting RAW. This SD card case has 22 slots and will keep them organized and close at hand. They’ll never lose their camera again. 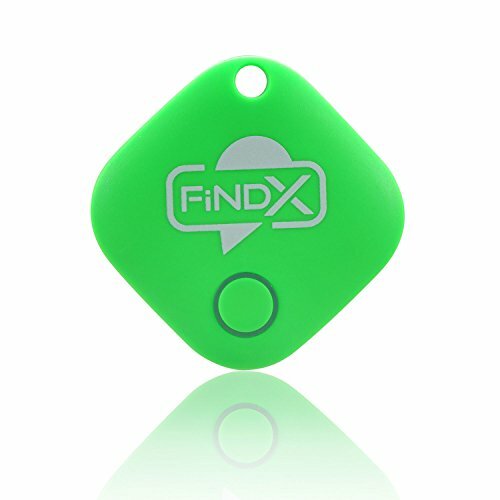 This FindX Find Anything is a handy tracking device will alert them to its location. An extremely handy and practical gift. Show your photographer friend that you care. It’s often-forgotten, but vitally important. 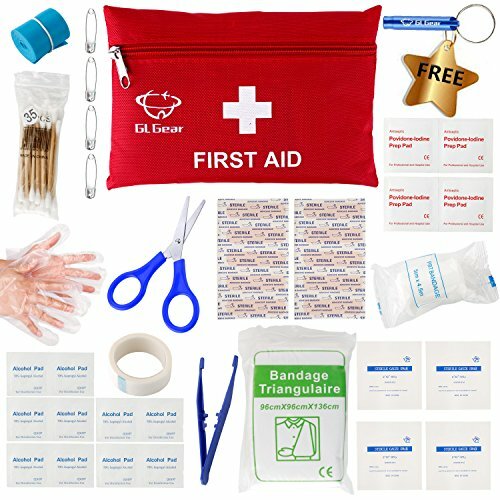 A portable first-aid kit like this medical survival bag will prove to be invaluable the first time any outdoor photographer finds themselves injured and far from home. Durable and lightweight, this kit is ideal for on-the-go. An equally important kit for long hikes or any trip into the great outdoors. 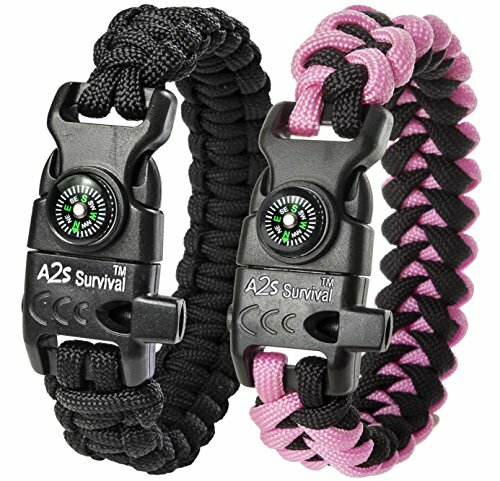 This survival bracelet contains fire starter and an emergency knife and whistle. It also includes a compass –which is also useful for determining which the direction the sun is in. This focus and zoom grip is perfect precise and smooth focusing and zooming. 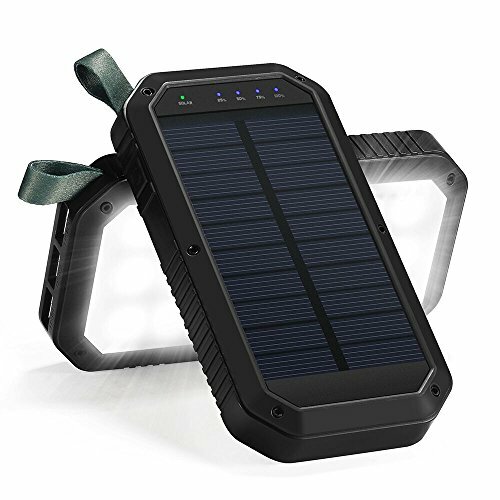 For photographers that sometimes overnight it, this solar charger would make a great companion. With three USB ports, it can charge three devices simultaneously. 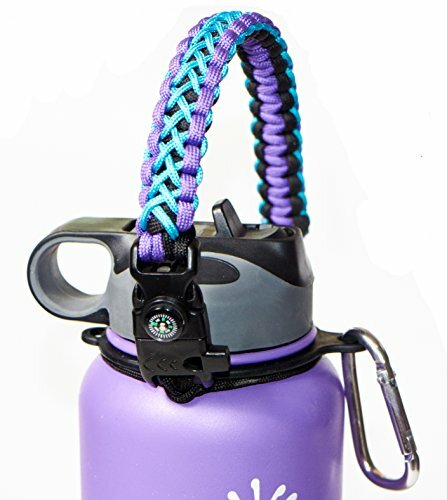 This paracord handle is a comfortable and fashionable way to carry a water bottle. No more leaks inside the bag or awkwardly fumbling with the flask. The perfect gift for on-the-go photographers. Keep all of those cords organized. 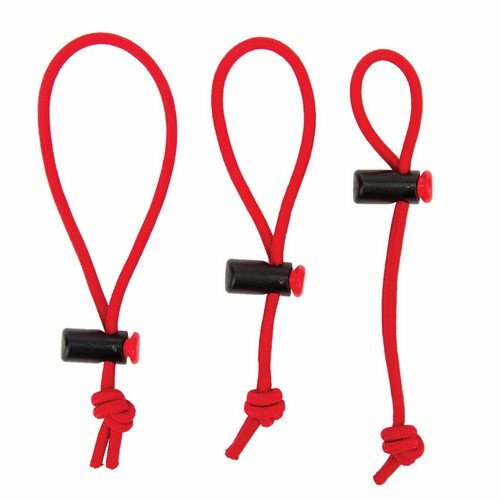 These adjustable cable ties will help your photographer to keep their bag tidy and organized. Extremely handy. As any outdoor enthusiast knows, you need protein-packed snacks to maintain your energy while you’re out. These Clif Energy Bars are easy to toss in the bag and go and will keep any outdoor photographer going. 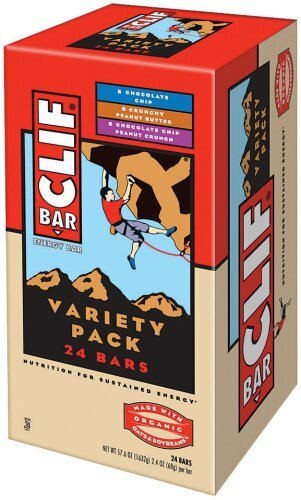 Contains: Chocolate Chip, Crunchy Peanut Butter, Chocolate Chip Peanut Crunch, 2.4-Ounce Bars, 24 Count. Likewise, a high-quality trail mix is also essential for outdoor adventures. This organic trail mix contains almonds, cashews, goji berries, mulberries and coconut chips. Packed with nutrition and with 5 grams of protein per pouch. A delicious snack that’s perfect for hikes. 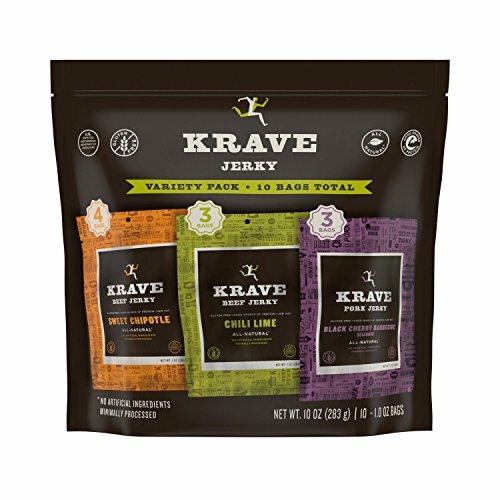 A good source of protein, and made with lean cuts of meat and gourmet ingredients, this KRAVE Beef Variety Pack includes Beef Jerky in Chili Lime flavor, Pork Jerky in Black Cherry BBQ flavor, and Beef Jerky in Sweet Chipotle flavor. 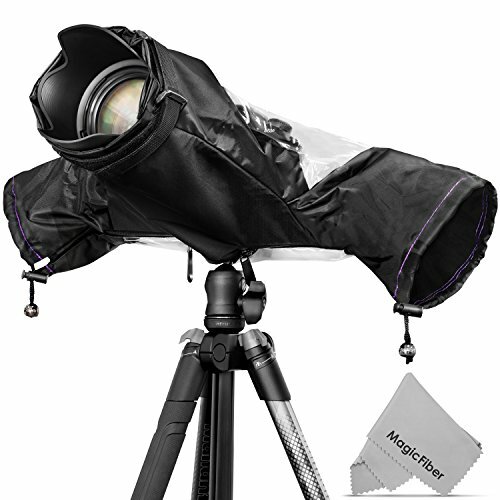 This Altura Photo Professional Rain Cover will keep your photographer’s camera nice and dry. Perfect for sudden downpours! 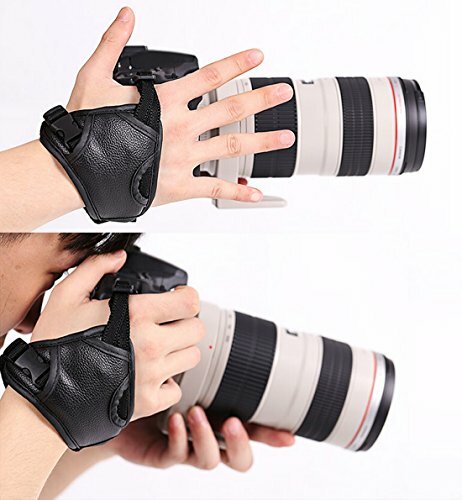 This camera grip wrist band hand strap allows photographers to shoot easily, without having to worry about dropping the camera. No need for neck straps either. 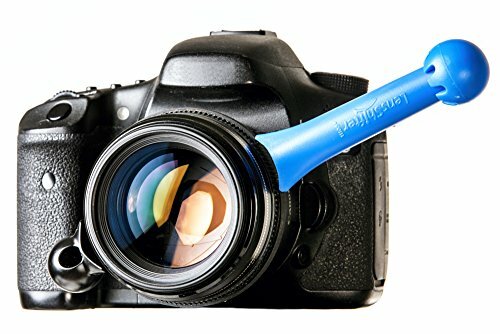 This professional camera cleaning kit will allow your photographer friend to keep their camera’s lens clear, shiny, and streak-free. 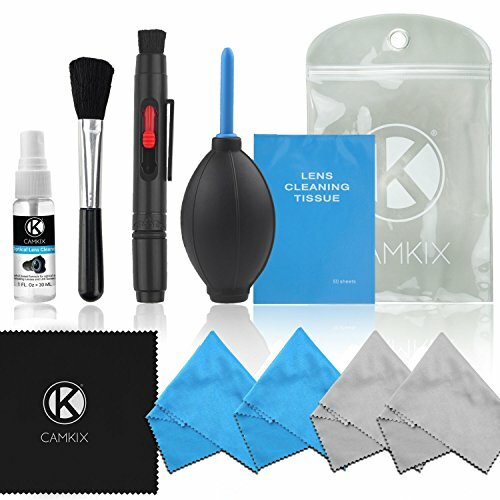 Includes cleaning pen, alcohol-free lens cleaning solution, lens cleaning tissues, and more. No more splotchy pictures. Buy your photographer friend this professional ND filter set, and they’ll be able to capture amazing long-exposure images. Includes an ND filter 1000x with 10 stops. 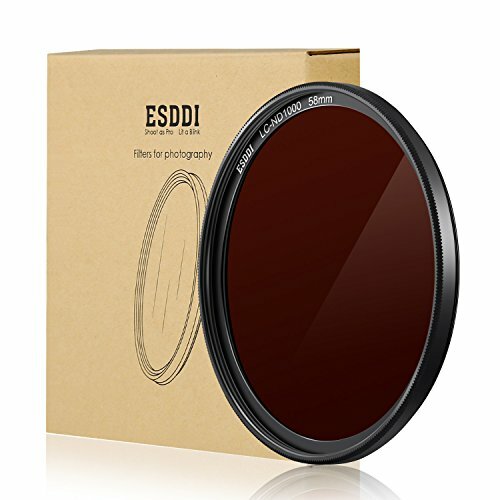 Its thin frame is suitable for the wide angle end and telephoto end of 58mm lenses with less vignetting on the images. What photographer doesn’t need these? 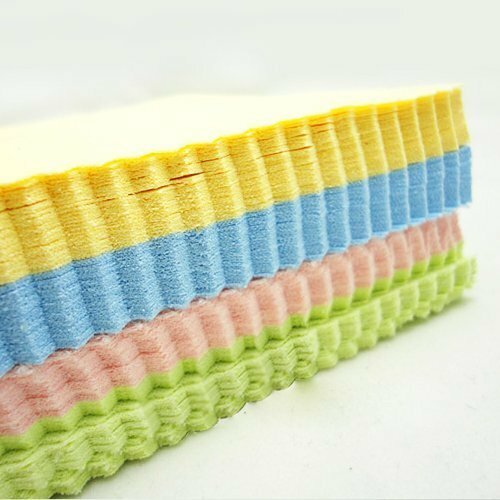 Handy and safe for lenses, these microfibre cleaning cloths are a perfectly practical gift. No more smudges. The perfect book to help inspire any photographer’s creativity. 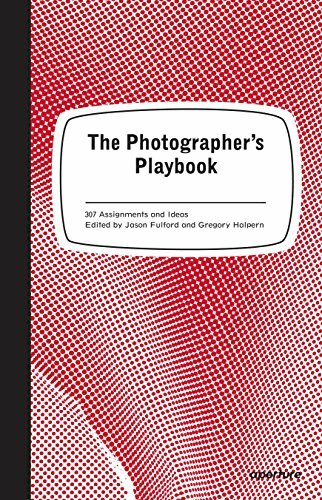 The Photographer’s Playbook is packed with assignments and ideas, so they’ll never be bored. 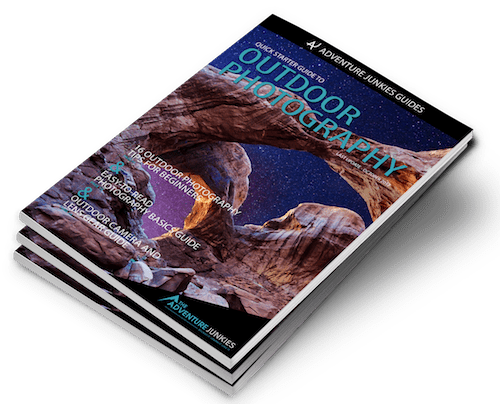 An extremely popular landscape photography book, Landscape Photography On Location: presents important information in an accessible and engaging way. Full of stories and insights; it also covers topics such as hiking, travel, and technical subjects. Good for beginners and professionals alike. 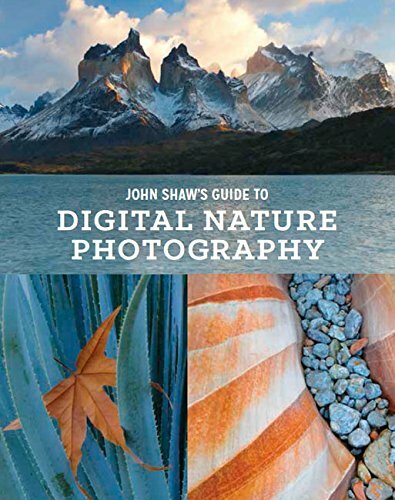 John Shaw’s Guide to Digital Nature Photography is full of helpful information on everything from equipment and lenses to technical information. It also includes more than 250 amazing images that are certain to inspire. Mountain Light: In Search of the Dynamic Landscape is a bestselling classic that’s a must-read book for mountain photographers. 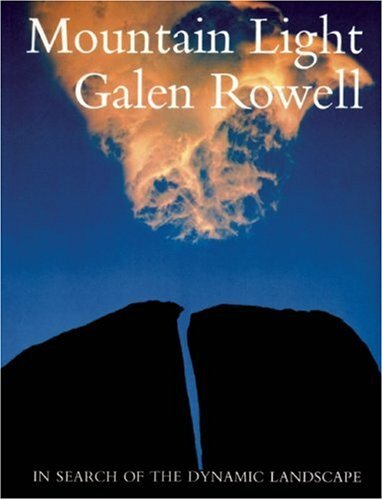 Written by Galen Rowell, often considered to be the father of modern day adventure photography, this book contains 80 of Galen’s finest images and essays about the creative, technical, environmental, and philosophical considerations that went into creating them. An elegantly written book that explores the craft of outdoor photography. The night sky is awe-inspiring, but it’s notoriously difficult to photograph. 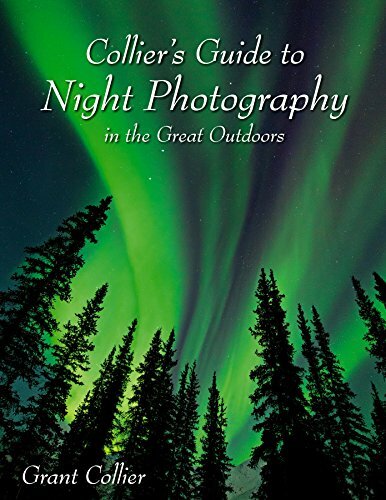 In Collier’s Guide to Night Photography in the Great Outdoors, author Grant Collier guides any nighttime photography enthusiast through the process of capturing amazing nighttime images. Starting with a look at equipment and supplies, as well as software and apps that are helpful when planning a shoot. Finally, there’s plenty of advice on capturing and processing nighttime images. These water bottles are ideal for long hikes. 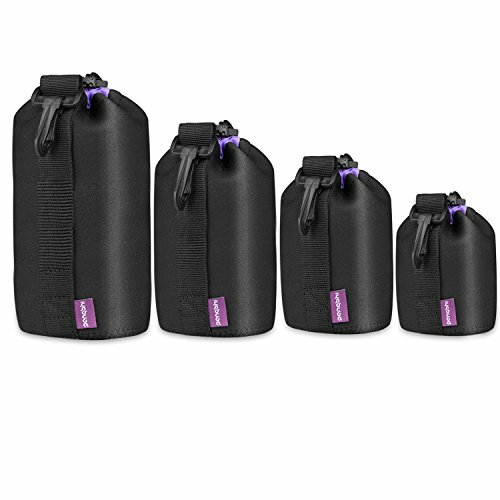 With a vacuum leak-proof lid, there’s no need to worry about spills inside the bag, or on valuable equipment. They’re also insulated so they’ll keep drinks cool longer. 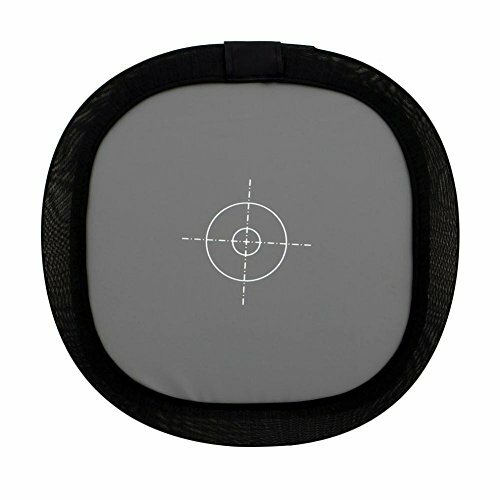 If your outdoor photography friend enjoys macro images or close-ups, this Etekcity 24″ Photo Reflector will help them to capture their shots in the best light. We all have tons of cables at our desks. These nifty AppleCore Cable Organizers will help your photographer friend to maintain a tidy workspace. Who couldn’t use a wireless remote? 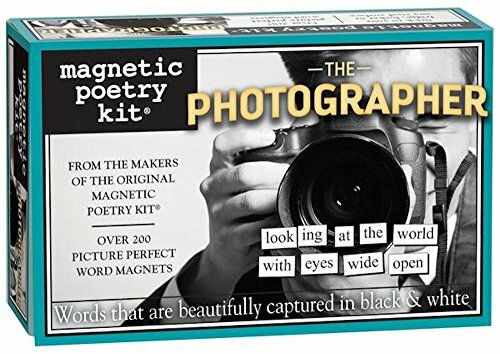 If your photographer doesn’t have one already, this is the gift to buy. 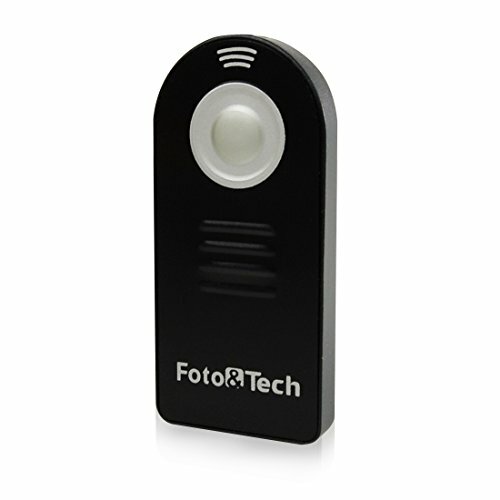 This Foto&Tech Wireless Remote is a handy little gadget that’s perfect for capturing long exposures, without the camera shake. Wildlife photographers can use it too –enabling them to capture the action, without scaring the animals away. 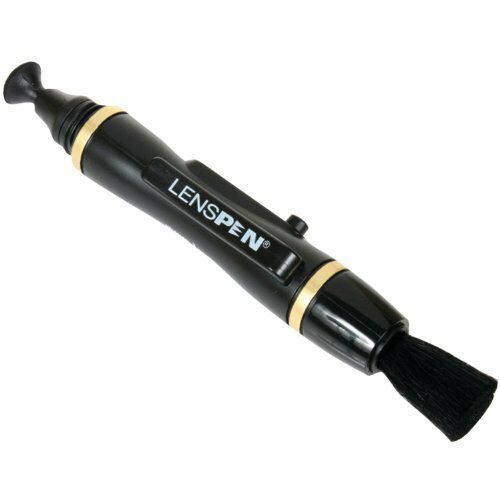 Few things are as handy as this lens pen; the perfectly portable way to spot clean a camera lens. It’s small and easy to throw in the bag and go. It’s extremely effective as well. No more toting their camera around on the strap that it came with. 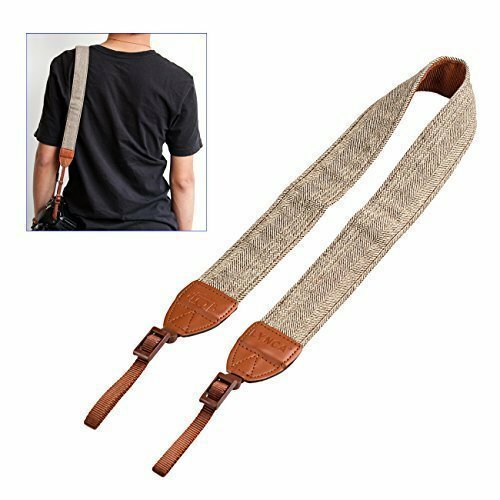 This TARION camera strap features an attractive brown weave. For all DSLR cameras including Nikon, Canon, and Sony. Just a memory card? 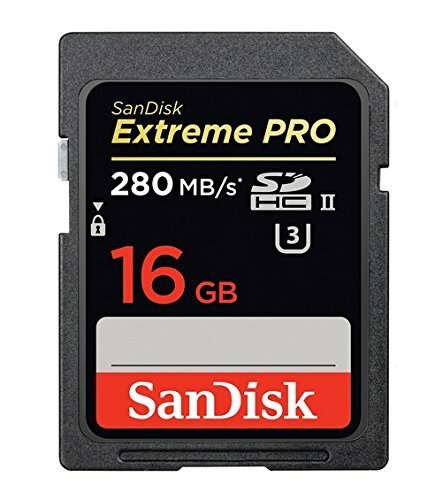 Yes, but this SanDisk has 16GB to hold loads of images. Plus, if they’re shooting in RAW, they’re going to need it! 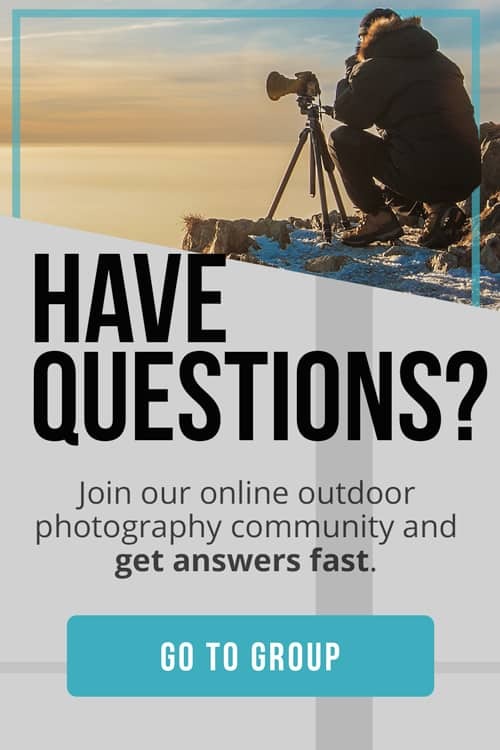 A subscription to Outdoor Photographer? Definitely! Magazine subscriptions are the gift that your friend will be able to enjoy all year long. And they’re special because it’s probably not something that they’d normally purchase for themselves. 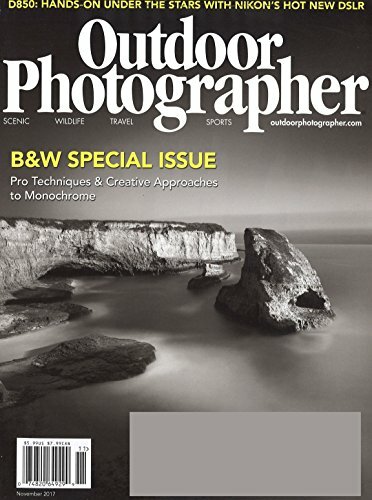 The editorial emphasis of Outdoor Photographer Magazine is on the practical use of the cameras in the field. It looks at the modern photographic world by encouraging photography as part of a lifestyle. It’s full of inspiration to and encouragement for outdoor photographers. 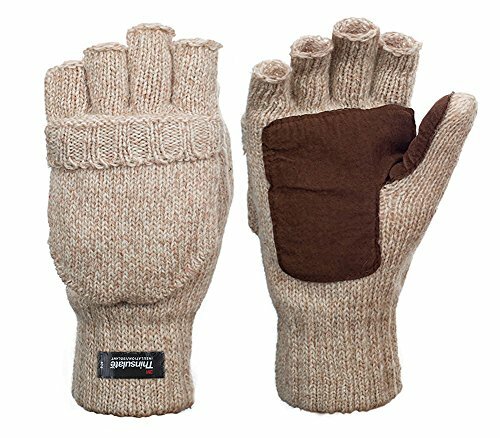 For keeping hands warm on chilly days, these Metog suede mittens feature a flap mitten cover, and fingerless gloves. Perfect for fiddling with buttons and dials on a cold winter’s day. 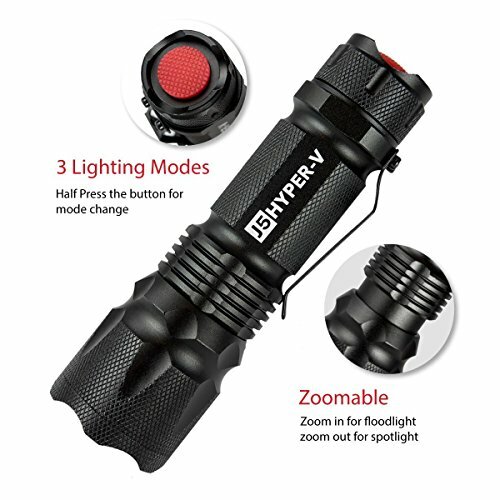 If your photographer’s a gadget lover as well, these handy high-tech Coroler Cool Fingerless LED Flashlight Gloves, with built-in flashlights, will be just the ticket. They’re perfect for a nighttime photographer, and will help to make the job of seeing dials and buttons on the camera, a bit easier. 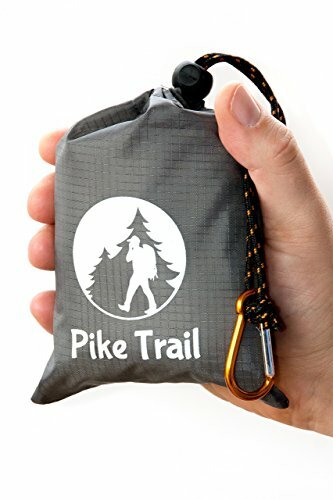 For any photographers who ventures out in a kayak or even on a hike when there’s a chance of rainstorms, a dry bag like this Waterproof Dry Bag Backpack provides necessary protection, keeping expensive gear safe from the elements. Cozy wool socks? Yes please! 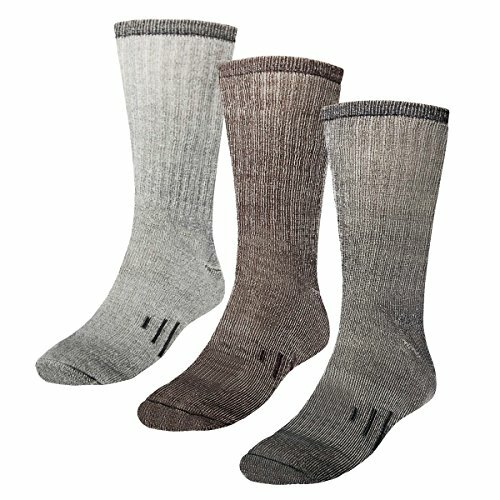 Consider these merino wool socks. We love the moisture-wicking features of wool, and your outdoor photographer will too! 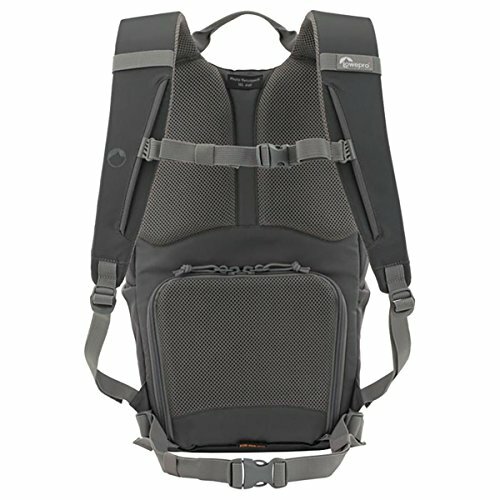 Perfect for hiking or long treks. 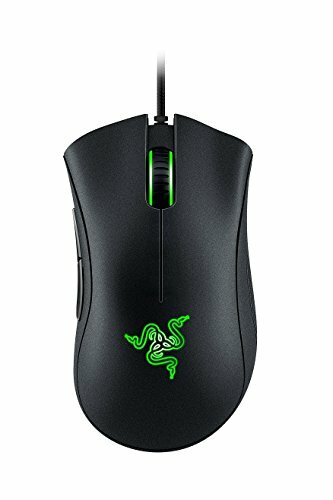 This ergonomic mouse is made for gaming, but it’s ideal for anyone who spends time editing photos. Much better than a laptop trackpad! 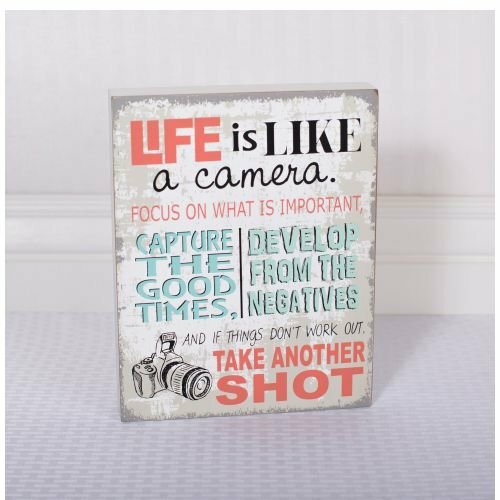 This inspirational sign, Life is Like a Camera, is perfect for budding or professional photographers alike. A good reminder to ‘focus’ on the important things. 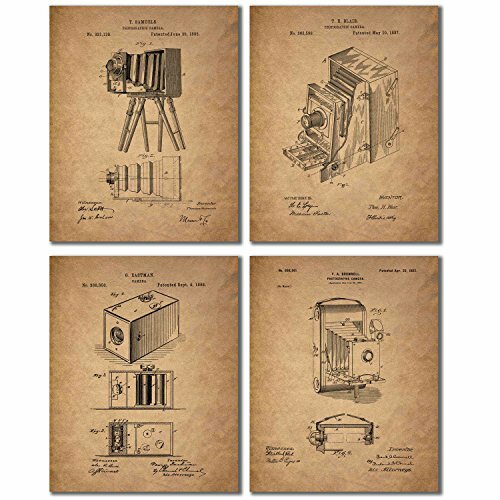 These reproduction camera patent prints would make the perfect collection for any photography enthusiast. This vintage ceramic vase is designed to look like a vintage camera. A classic decoration for the home or office. 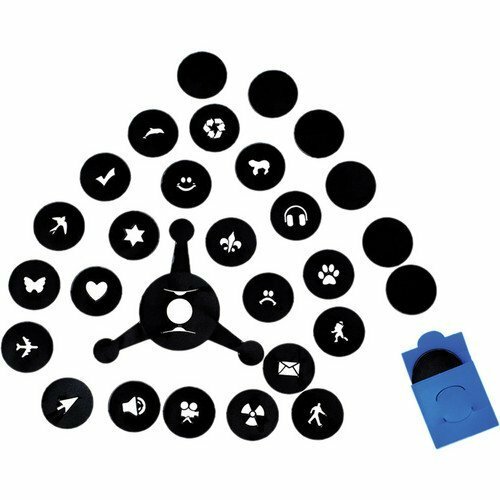 This fun magnetic photographer kit is ideal for photographers with a creative streak. A great gift to inspire creativity. Know a photographer who also loves interior design? 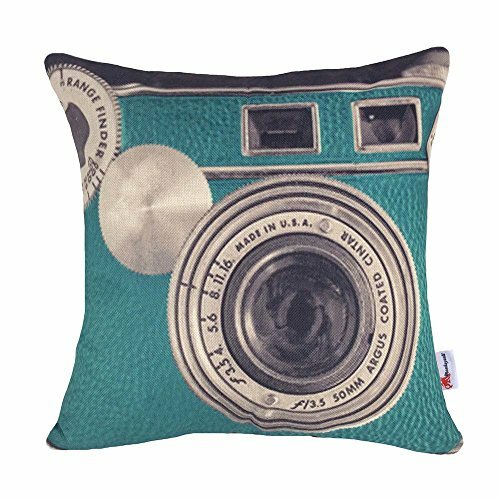 This vintage camera pattern cushion is sure to brighten up their space. 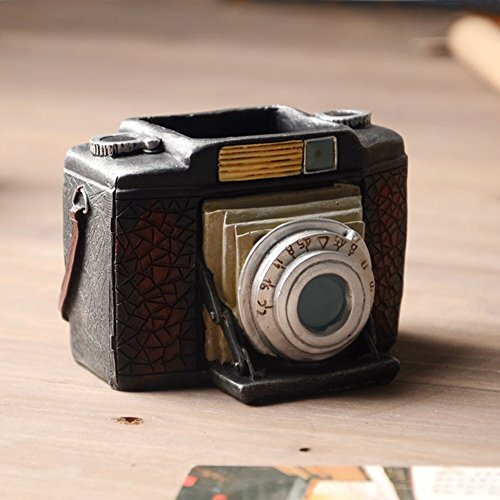 A fun and decorative pen holder, this retro camera desk organizer would make a great gift. Can you smell the old pebbly leather on Galison’s trompe l’oeil Vintage Camera? 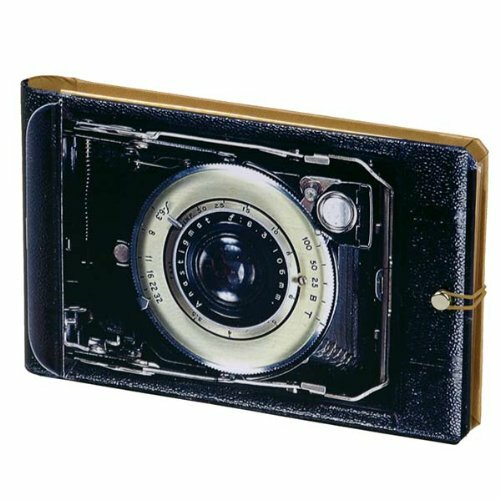 It’s actually a photo album, but it’s one that recalls the good ol’ days of film. 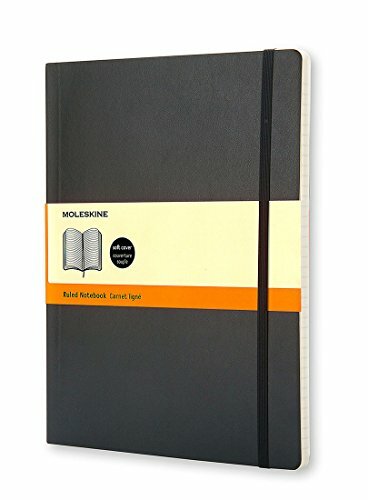 A moleskine notebook is perfect for jotting down photography notes, location details, or for serving as a journal. The perfect little gadget! 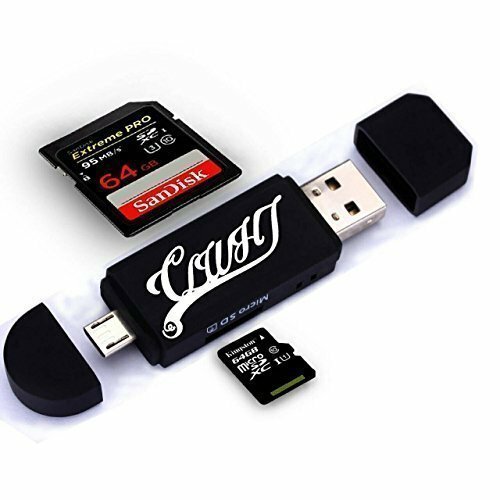 This USB card reader adapter lets you transfer images from your memory card, via USB port. 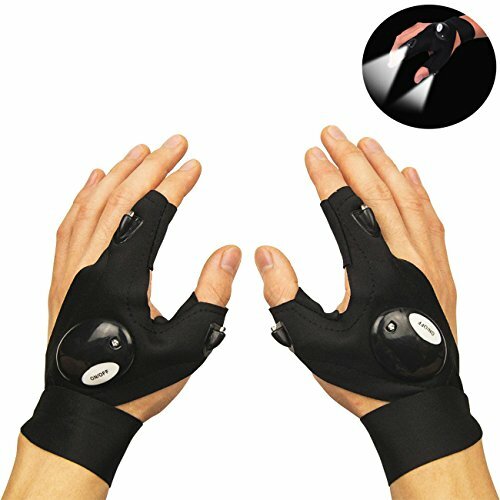 Perfect for moving images from the camera into a computer that doesn’t read memory cards. 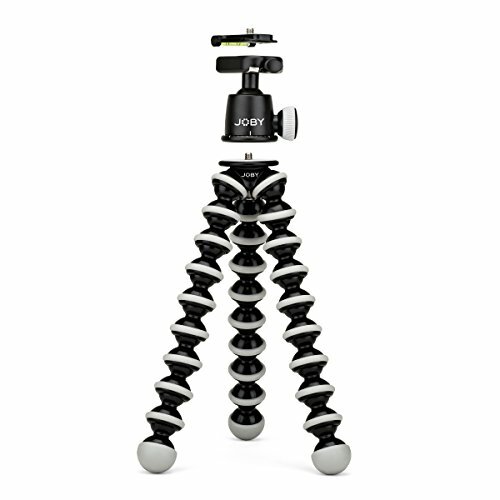 This JOBY GorillaPod tripod is durable and lightweight, making it ideal for taking on hikes. The rubberized foot grips and wrappable legs will secure professional cameras up to 6.6lbs. 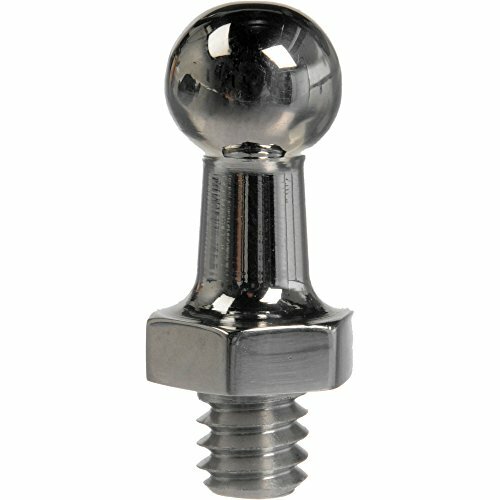 Know a photographer Mac user? 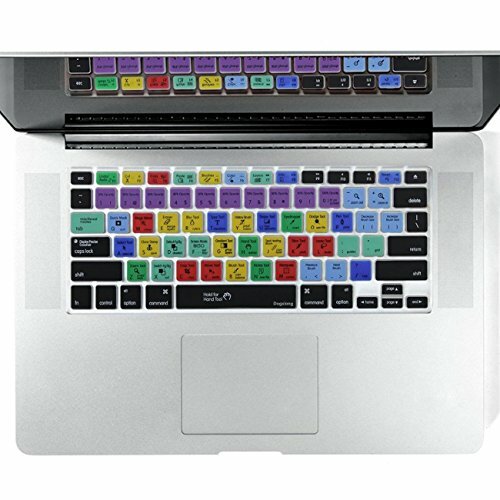 Help them become a Photoshop master with this Adobe Photoshop Shortcuts Keyboard Skin to make tasks easier and faster than ever before. This Polaroid Hot Shoe allows photographers to make sure their camera is set up level on a tripod. 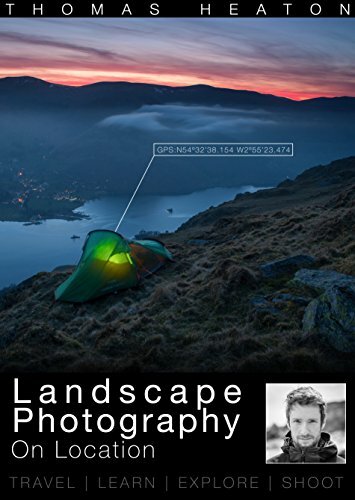 A must for landscape photographers who want to steady their horizon lines! Finding a place to put the lens cap when shooting can be a challenge, but not anymore. 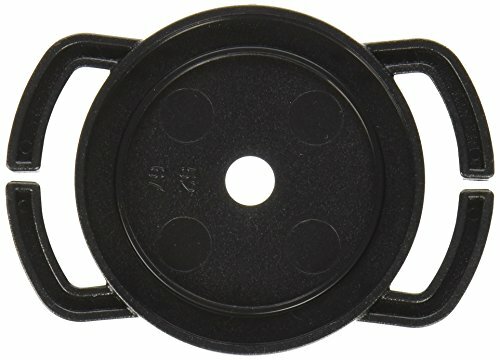 With this lens cap holder, your photographer won’t be losing lens caps nearly as often! What photographer doesn’t love bokeh? With the Bokeh Masters Kit, photographers can create bursts of light in a range of fun shapes. 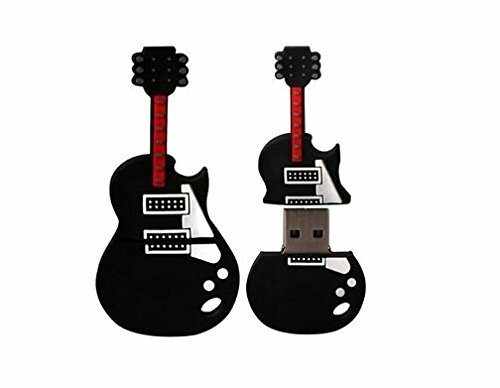 A USB flash drive is a fun and practical way of storing all of your important files and documents. This high speed pen drive is shaped like a camera and lens, and comes with a necklace to keep it from getting lost. The perfect gift! These plush lens pouch cases protect lenses from bumps and scratches. 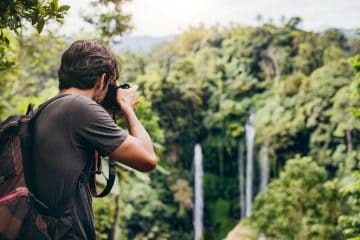 Perfect for photographers who love hiking or traveling. 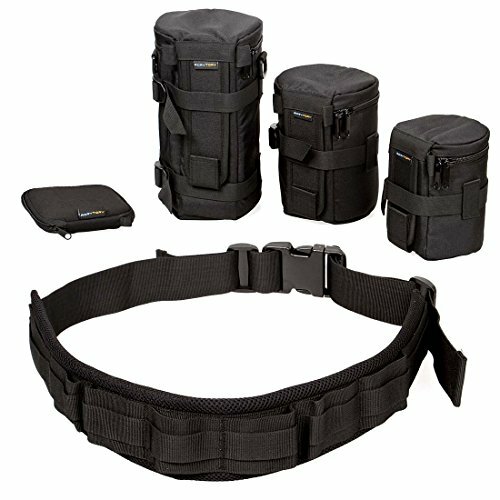 This Incase DSLR Camera Insert Kit is perfect for keeping lenses and gear from bumping into each other while on-the-go; and is also ideal for stowing gear while at home. 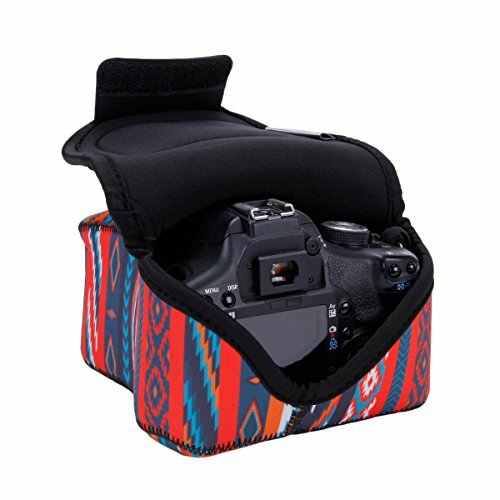 Another camera case, this DSLR camera case features DuraNeoprene to safeguard any DSLR. It also has zip pockets for memory cards and small accessories. Available in a range of different patterns. When it comes to stabilizing the camera, a bean bag is a simple yet effective solution. 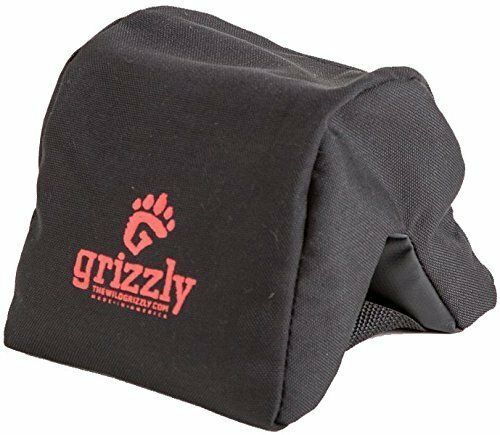 This Grizzly camera bean bag is perfect for wildlife photography –place the beanbag over an open window, and rest the camera on it for added stability. This bean bag allows you to fill it with anything from bird seed to rice, dried beans, or sunflower seeds. Every outdoor photographer needs a good flashlight. This J5 Hyper V tactical flashlight is extremely bright, producing an intense beam of light for up to 800 feet. It’s also durable, perfect for hiking and outdoor use. Draw partner! This SpiderHolster camera holster leaves hands and upper body unrestrained and can be used with your own belt. Ideal for point-and-shoots and lightweight DSLRs. 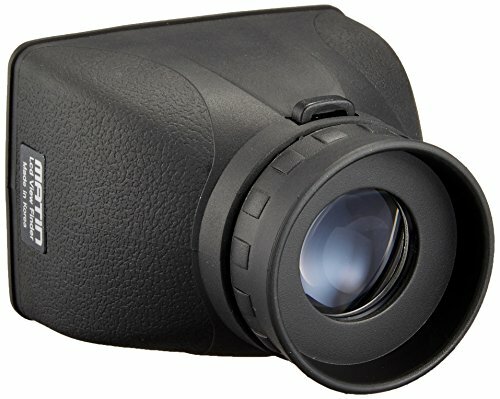 This Matin 2x LCD view finder extender reduces eye fatigue, providing 2 times magnification without distortion or blur! The neck strap makes it easy to carry. A technological upgrade to standard wall chargers, this Portable Power Adapter: USB Wall Charger simultaneously charges both phone and battery backups. A true grab-and-go solution. This ultra-compact sand-proof and waterproof pocket blanket is perfect for taking on hikes or treks. It’s perfect for use in dirty and damp conditions. 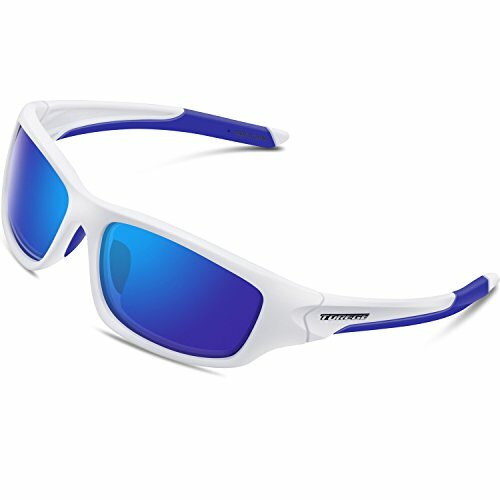 Clear, super light, and durable –these Torege polarized sunglasses offer UV400 protection coating, and block harmful UVA & UVB Rays. The polycarbonate lens and frames are impact, scratch resistant, durable and unbreakable. 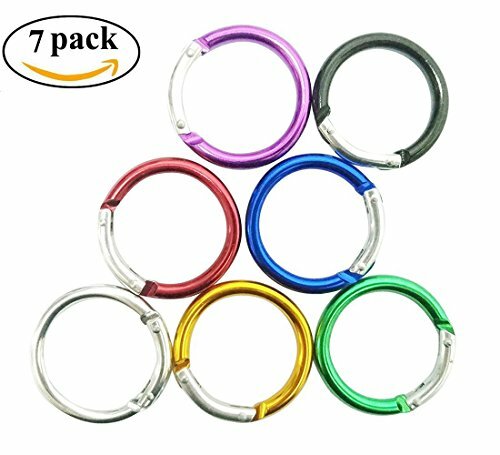 This set of six carabiner hooks will certainly come in handy for any photographer’s outdoor pursuits. 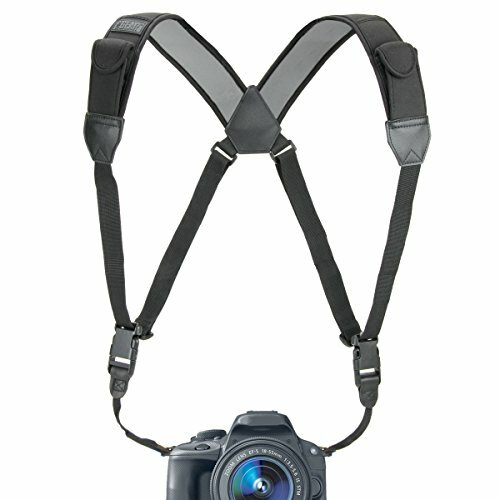 Featuring an adjustable design, this camera harness provides a comfortable and custom fit. The even weight distribution is ideal for anyone who totes a camera around for hours! 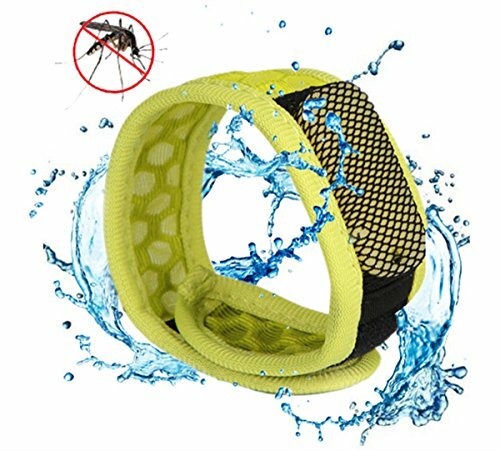 This mosquito repellent bracelet is ideal for pest control. Perfect for taking on those long wilderness hikes. It’s waterproof and DEET-free plant-based oil protection. It may not be the most stylish hat in the world, it is designed to for extreme effectiveness. 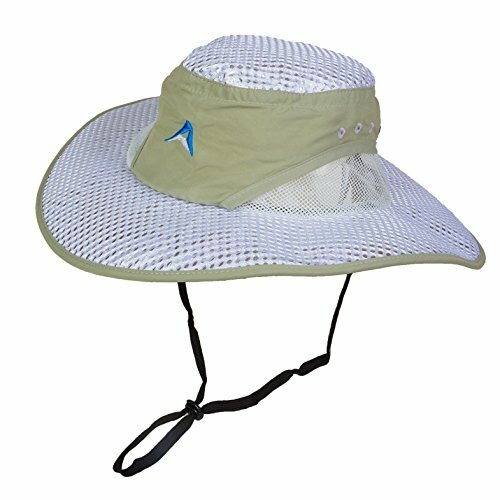 This Alchemi Labs River hat blocks 99.8 % of skin damaging UV rays with a tested UPF of 800+, and can even reflect up to 80% of the sun’s heat waves! It also has built-in ventilation and moisture-wicking sweatbands. 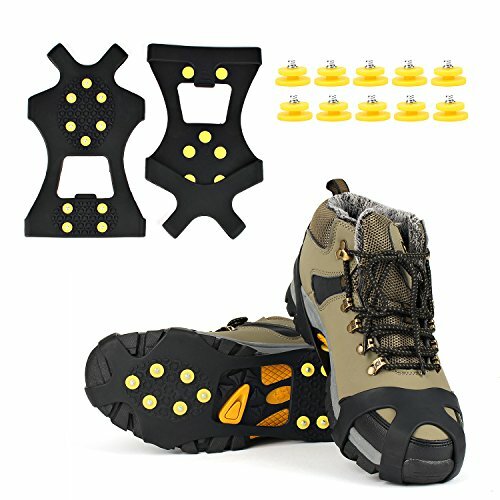 For winter hikes over slippery terrain, these traction cleats are easy to get on and off. Fits over boots and sneakers alike. This portable match container features a waterproof sealed container and is a mini key ring that’s perfect for keeping matches/toothpicks/pills clean, dry, and handy. Makes a great gift. 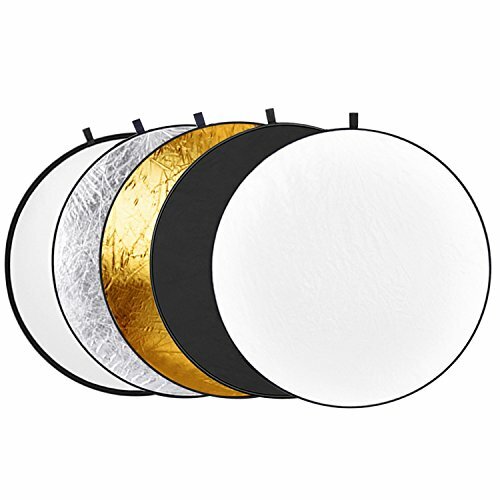 This grey card helps to simplify the process of exposure and color correction when working in difficult lighting conditions. 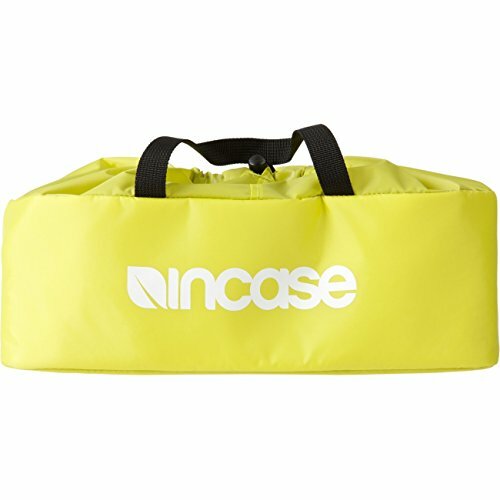 Folds up small and compact, and includes a handy nylon carry case. Who wouldn’t love fresh espresso while on-the-go? 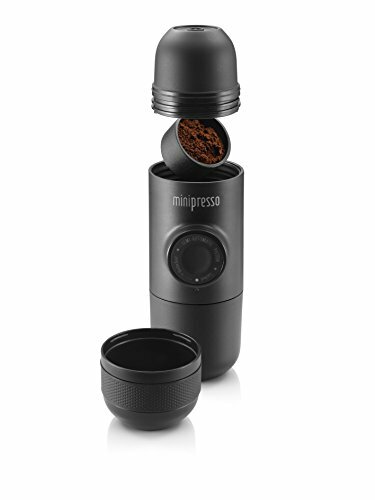 This MiniPresso GR Espresso Maker makes it easy to enjoy fresh espresso shots –even in the remote wilderness! Compact and featherweight, this little espresso maker features powerful extraction pressure for a rich and strong shot. A great device that’s sure to be a hit with any coffee-loving photographer. For the serious photographer, this RoryTory camera lens bag belt accessory will prove to be an invaluable and hands-free way to keep track of everything. It’s especially ideal for the photographer who likes to keep a range of different lenses close at hand. Here’s a fun novelty item your photographer friends are sure to love. 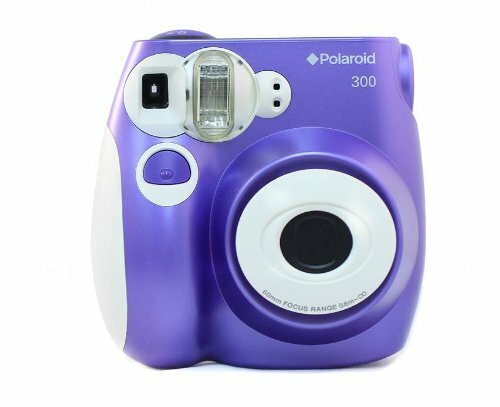 This Polaroid PIC-300 is like taking a stroll down memory lane. Plus being able to see prints of your images, instantly, may never really lose its appeal. 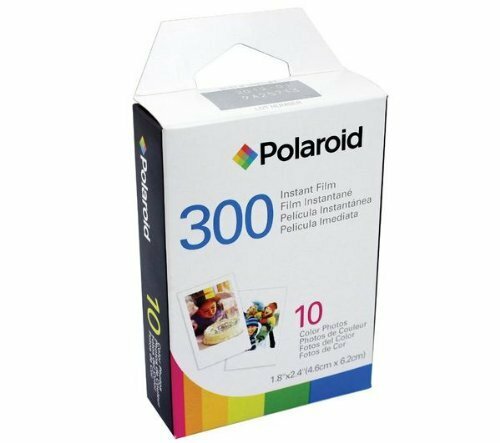 Compatible with PIF-300 Instant Film. And of course, you’ll need some film to go with that film Polaroid camera. This 7-pack Polaroid camera film is sure to get any photographer off to a great start. 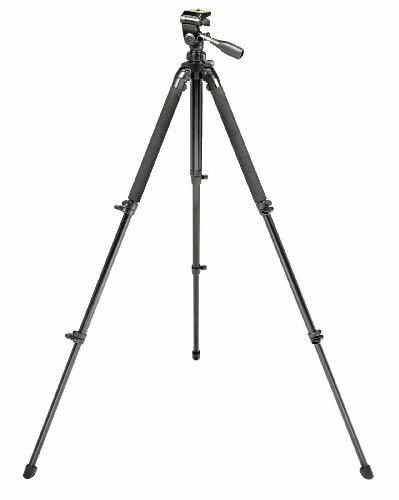 This Bushnell Advanced Tripod features adjustable legs, and a durable and beautiful design. 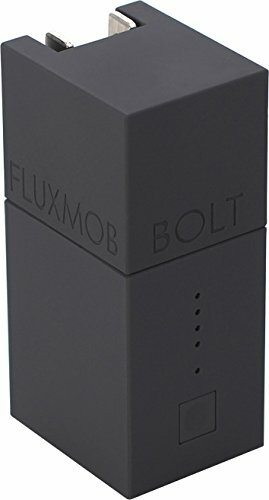 It’s ideal for capturing landscapes and long exposures. 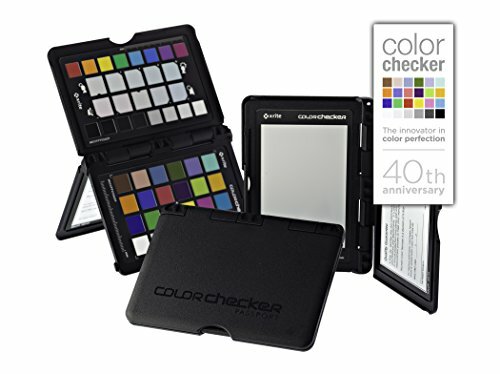 This ColorChecker Passport is a powerful ‘capture to edit’ color solution for any photographer looking for more accurate, consistent color. A fun way for a photographer to display their favorite photos. 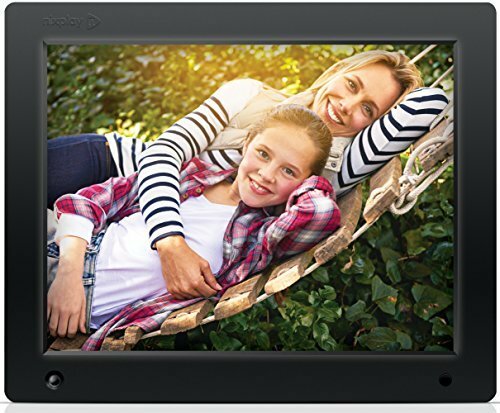 This Nixplay digital photo frame can easily sync with Facebook, Instagram, Flickr, and more. This Lowepro photo camera case is an excellent way to carry camera and gear long distances. 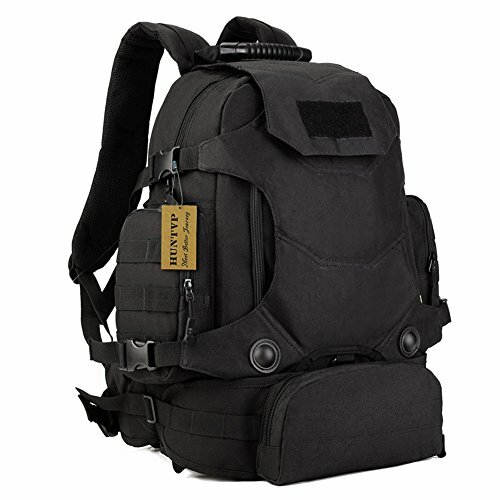 This Huntvp 40L backpack is another great solution for toting camera gear around. 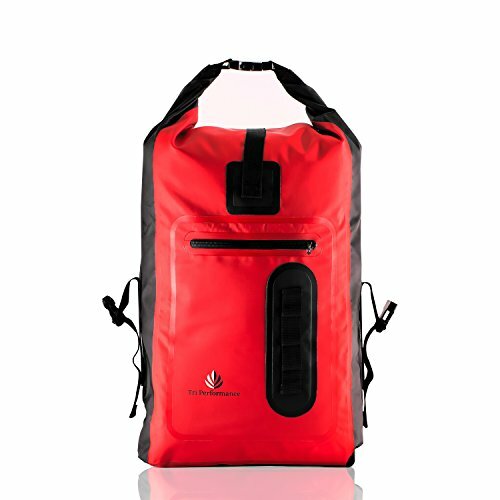 Made of water-resistant fabric, this high-strength backpack is extremely durable. 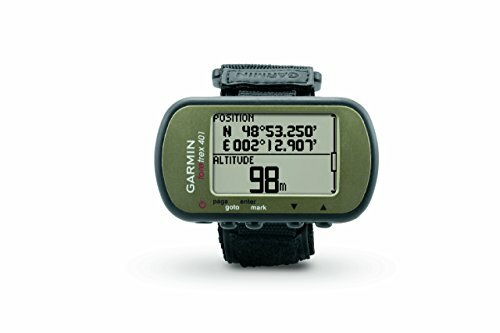 This high-sensitivity Garmin Foretrex hiking GPS is ideal for long wilderness treks. Offering improved performance and reception even in heavy tree cover or deep canyons. It can even retrace user’s path. It can also display sunrise/sunset times. For the adventurer photographer, this GoPro HERO5 is certainly ranks high on their wish-list! 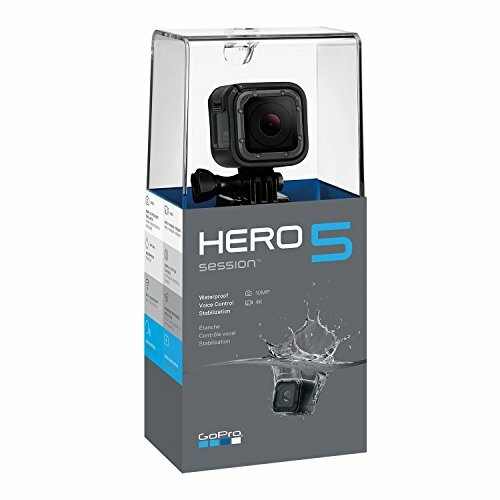 Offering image stabilization as well as a waterproof design and exceptional durability, GoPro is ideal for capturing adventure photography. With its stunning 4K video, one-button simplicity, and voice control, HERO5 Session may be the ultimate combination of performance and small size. 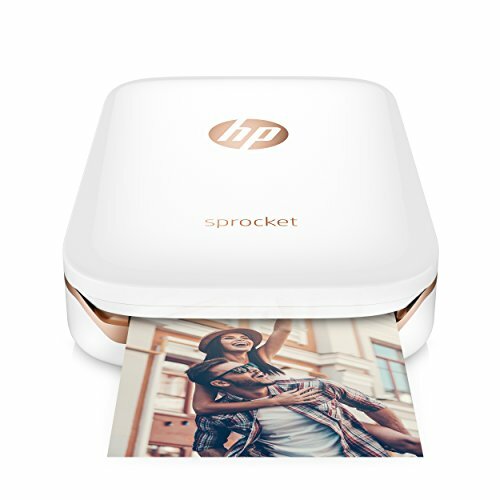 This HP Sprocket portable photo printer is ideal for on-the-go printing. Using seamless Bluetooth connectivity, it’s easier than ever to print from a smartphones or tablet. Know a photographer who loves macro or close up nature photography? 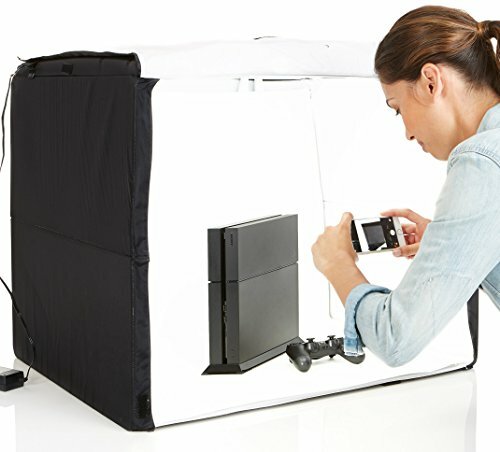 This AmazonBasics Portable Photo Studio is a great way to capture those small, delicate details, allowing for perfect lighting. 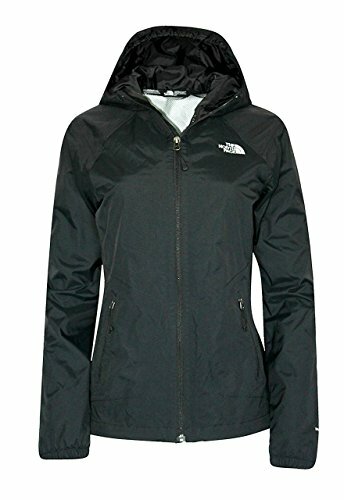 This The North Face rain jacket is both water and wind-resistant. Perfect for tossing in the backpack in case of showers. Featuring brushback knit fabric for maximum comfort, breathability, and warmth, this Under Armour mock is perfect for layering on cold winter hikes. The signature moisture transport system wicks sweat to keep you dry and light. 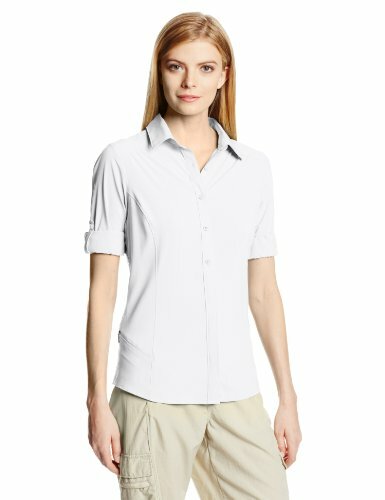 Crafted from a light and soft stretch-flex fabric with a lovely drape, this ultra-versatile Columbia Sportswear shirt is perfect for hitting the trails. The sweat-wicking power to pull moisture away from the skin, hidden venting, and UPF 30 sun protection provides protection from burning and long-term skin damage. This 12-in-one headband is a versatile and extremely useful piece of kit. 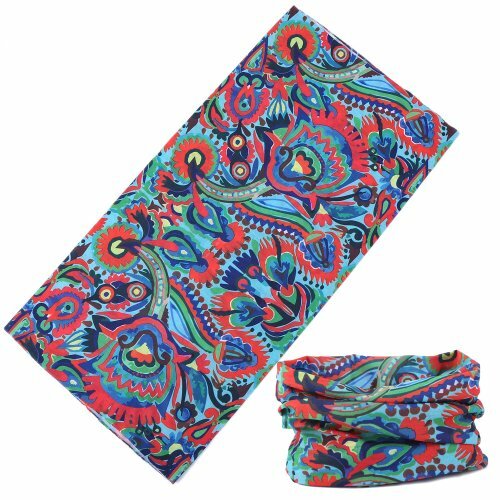 Works as a headband, neck warmer, bandana, balaclava, and cap; and in the winter, you can rock it as a lightweight neck gaiter, face mask, beanie, or balaclava. For the summer, it’s a tough headband to wick away sweat and offer protection from the sun, wind, and dust. 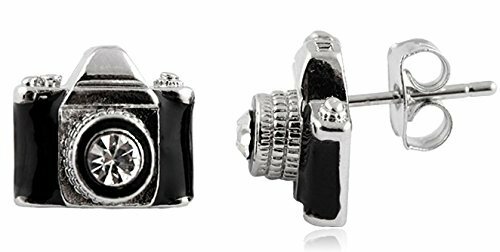 These beautiful black and silver camera stud earrings are perfect for any stylish photography-lover. 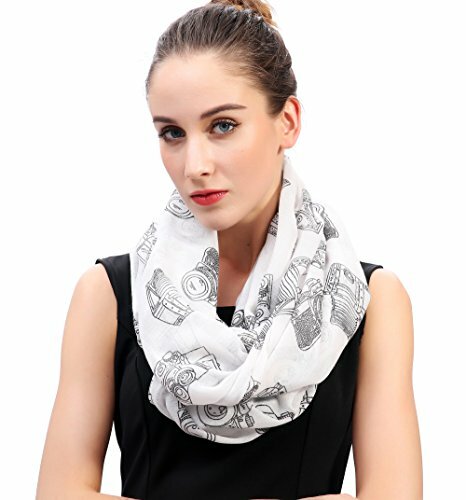 This fun and fashionable Lina & Lily Infinity Scarf is the perfect accessory for any photographer’s outfit. 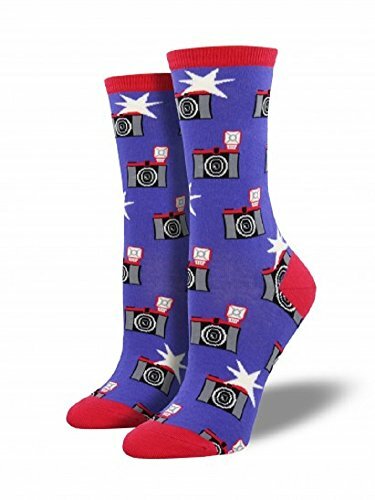 ‘Snap up’ these socks for your photographer friend. They’re a perfect thinking-of-you gift. 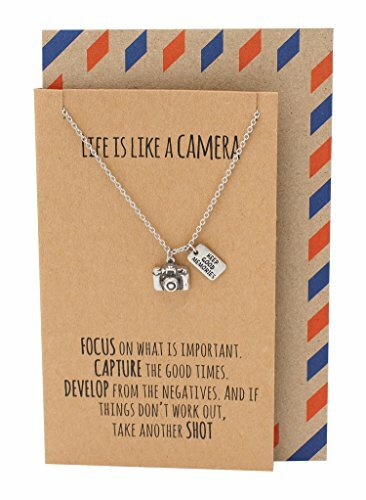 This cute point and shoot camera charm necklace features a tiny camera pendant, and includes an inspirational quote. 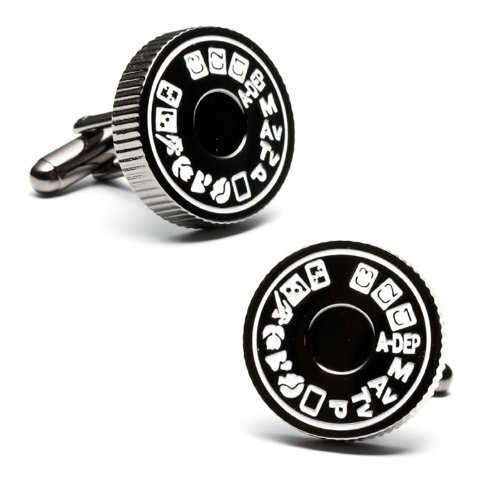 These camera mode dial cufflinks are perfect for any fashion-forward photographer. 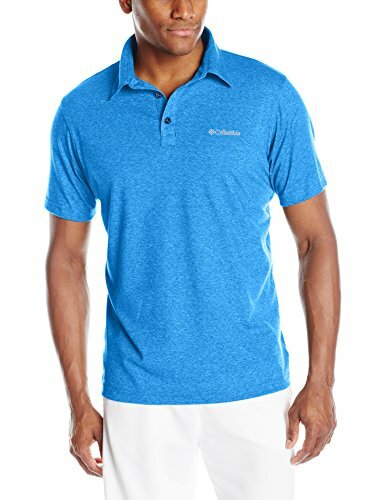 This Columbia Men’s Thistletown Park polo from Columbia features omni-wick to pull moisture away from the body. This also offers UPF 15 sun protection. 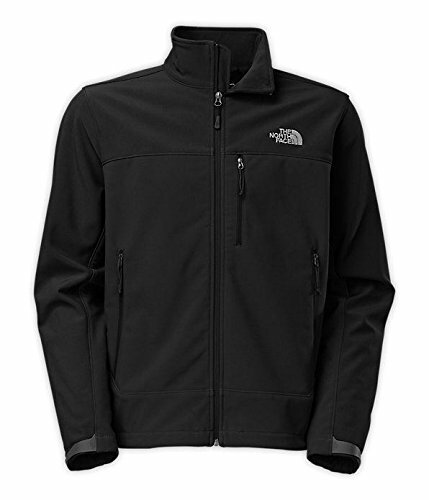 This The North Face Apex Bionic soft shell jacket is light yet warm. 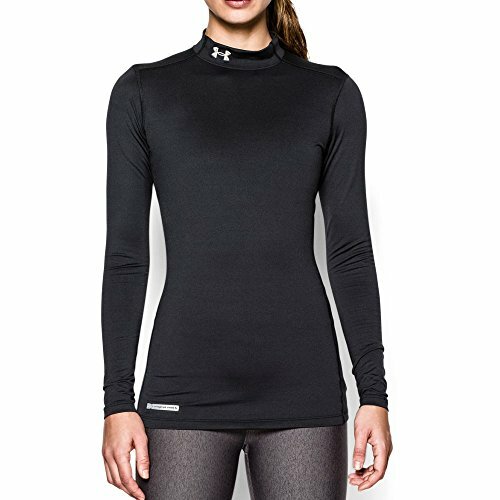 It’s great for hiking in chilly weather, and perfect for layering up on those cold winter days. 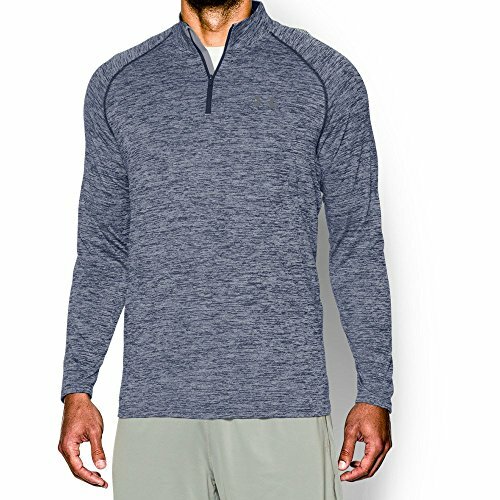 This long-sleeve Under Armour Men’s Tech 1/4 Zip is perfect for cold winter’s days. With quick-drying ultra-soft fabric, it also features anti-odor technology to prevent the growth of odor-causing microbes. 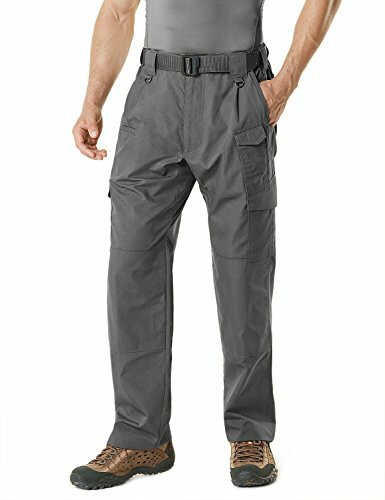 These heavy-duty CQR Men’s Tactical Pants are perfect for photographers. With multi-purpose pockets –that are ideal for holding various tools and equipment, they also contain Duratex fabric to repel liquids and dirt. 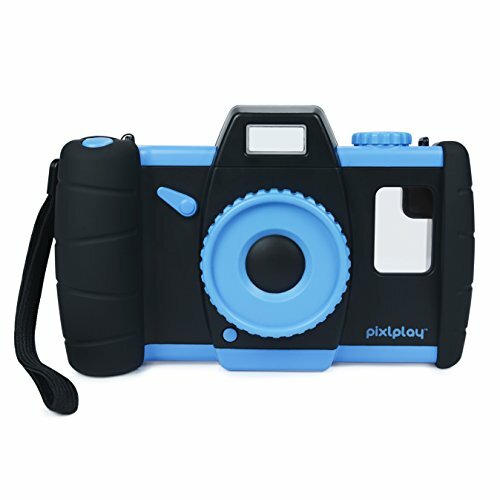 For the budding photographer in your life, this Pixlplay Camera makes it easy to turn a smartphone into a fun kid’s camera. Fits the majority of all standard size smartphones. 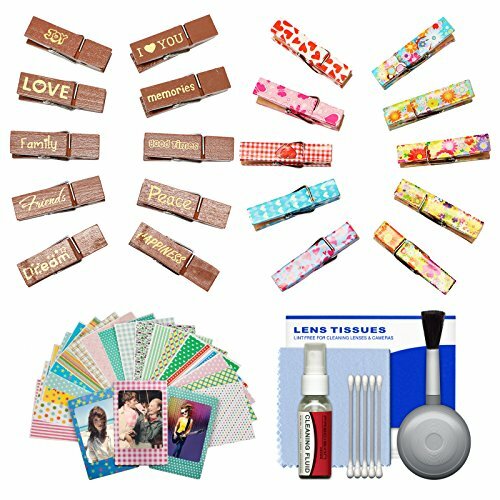 Kids will love displaying their photos with the magnetic frames and tiny wooden pegs in this Fujifilm Wood peg clips with magnets set. This fun and colorful kit allows them to show off their photography in a stylish way. 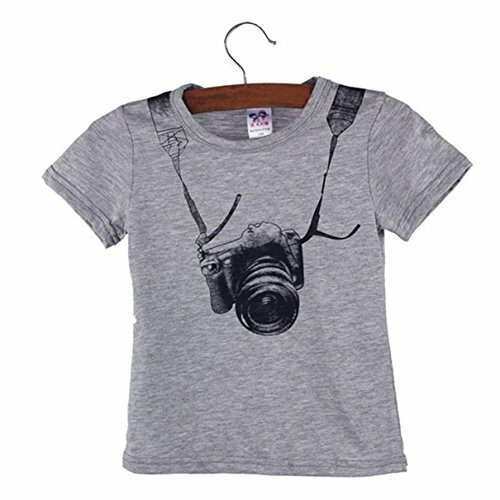 This Witspace t-shirt for boys or girls includes an image of a camera around their neck. Sure to be a hit with any up-and-coming photographer. 100% cotton. Very cool! 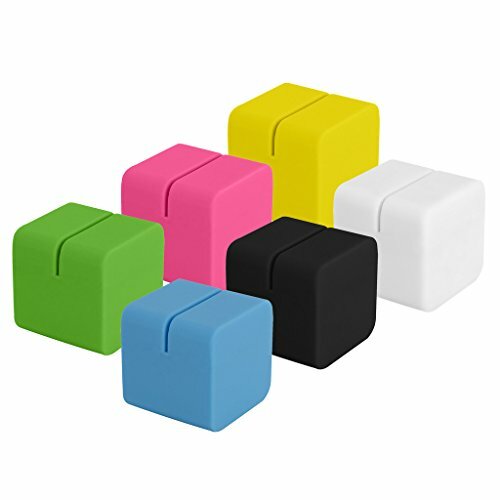 Budding photographers can use these 6 colorful cubic photo stands to display their favorite images on their desk or shelf! 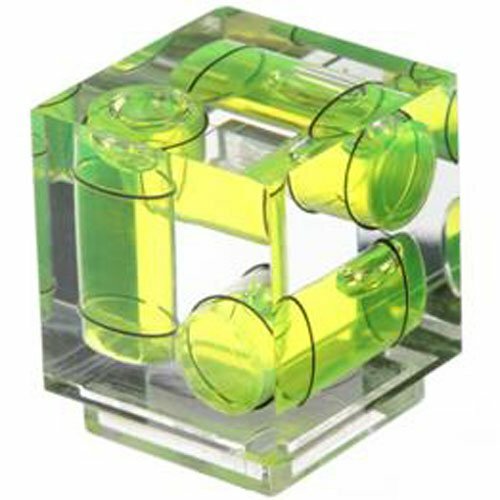 These cubes are super fun for kids and grownups alike, and the cube design makes it easy to swap images out. Go Photo! 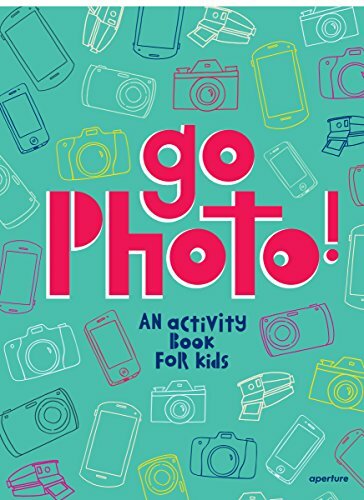 An Activity Book for Kids is the perfect gift for any young photographer. Full of activities that kids can do, it’s a great way to help a young photographer to get off to a great start. Ideal for children ages 8-12.